As has become something of a yearly tradition for Electronic Arts, the publisher is shutting down the online servers for eleven of its games. On April 13, EA will kill the online servers for FIFA 10, Bloom Blox, and MMA, among other titles in its library that it says are "no longer feasible" to keep running. Fewer than 1% of EA's online players are using these games, the publisher said, making it tougher to justify keeping engineers and IT staff on those servers. Perhaps adding insult to injury is the fact that MMA, which is only eighteen months old, required Online Pass, a one-time use code for multiplayer and online content that you'd have to purchase separately if you bought the game used or borrowed it from a friend. If you did buy an Online Pass for MMA, it was a very short-term investment. 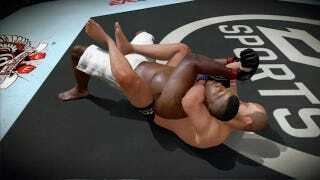 "*Sigh* Some very good times on this game.. met some true friends.. won some money and met some fight-game enemies," one user wrote on EA's forums. "I have to ask, why do the servers need to be shut down?" We've reached out to EA Sports for comment and will update should they choose to respond.